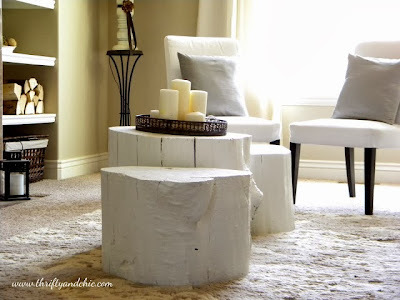 Posted this adorable little coffeetables made out tree trunks painted white. Such a nice DIY to do dont u think? Thank you very much for your wonderful posts, it is a true inspiration for many readers, there is always something new to discover and I am sure you awake the desire in many readers to keep reading your posts. Thank you for the beautiful photos! Amazing blog! Hugs from Portugal! I've seen several photos of natural stained tree trunks serving as end tables but I've never seen a painted one. It's great - great design. ruediger thank you for your sweet comment. I would like to post even more and do lots of DIY proyects, I have a lot of passion for decorating, but being pregnant and having a 2 year old makes it difficult to spend more time on blogging. Thnaks for reading. Jan, I love to paint almost anything in white, a big passion for that color. before you can paint it? how do you get the bark off of it?